How Do You Check if a Point is on a Line If You Have an Equation? 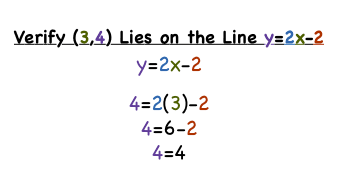 Wondering if a point is part of the equation of a line? Got the equation of the line but no graph? No problem! Just take that point and plug it into the equation and simplify. If you end up with a true statement, the point is indeed part of the equation. If you end up with a false statement, then that point is not part of the equation. See this process first-hand in this tutorial! How Do You Check if a Point is on a Line If You Have a Graph? Wonder if a point is part of a line? You could take that equation and graph it. Then use the graph to get your answer! Watch how in this tutorial.